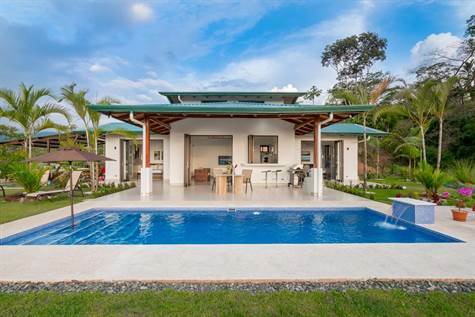 With easy access 600 meters off the Carretera and magnificent views of the Ocean and mountains, this new, well constructed, sleek and modern house offers everything for the discerning buyer. From shaded carport enter to comfortable terrazzo with breakfast bar and windows that fold completely open to the kitchen. 180-degree views over the pool with small waterfall. Main room entry through fully folding doors and hideaway screen. All doors and windows are top of the line anti-theft Extralum Europa. Living area includes Euro concept cabinetry and Samsung 55" HD flat screen TV. Kitchen boasts top of the line Frigidaire Gallery and LG kitchen appliances, seamless Krion countertops and stainless steel Blum Legrabox Austrian drawers. All faucets and shower fixtures are german Grohe. Two bedrooms en-suite, each with walk-in closet, Innovaire A/C units and spacious shower. Remote controlled ceiling fans are new generation silent and energy efficient Minka Aire. There is laurel wood cathedral ceilings throughout.